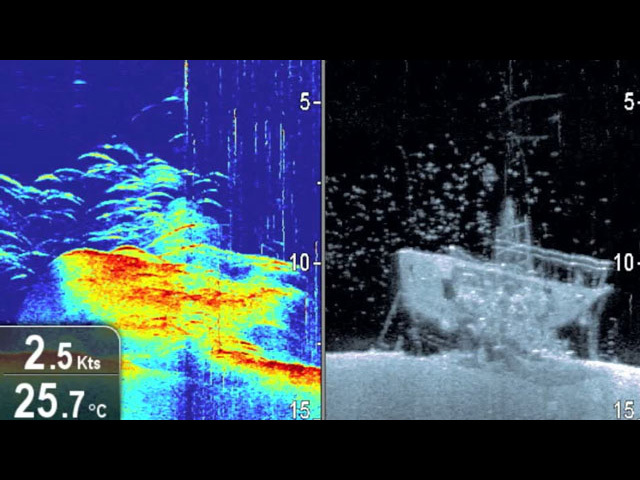 There are many features to consider when purchasing a new fish finder.. Considering ease of use, power, screen size, CHIRP and scanning abilities all come into play when purchasing a new sounder for your boat. The technology is greatly improved from just a few years ago, so make sure you find the best unit for your boat and style of fishing. This screen shot illustrates the strengths and weaknesses of traditional views vs scanning mode. Notice how the structure itself is far clearer on the imager/scanner (right), but the fish show up in clear, identifiable arches in a traditional view (left). Side imaging units can provide spectacular detail. However, they're most effective in shallow waters. Old School sounders used a 50/200 kHz beam (or thereabouts). CHIRP lets the unit sweep through a range of 25 kHz to 200-plus. The larger the range it sweeps through, the better, and units with multiple channels that can sweep more than one range at the same time have a significant advantage over single-channel CHIRP units. 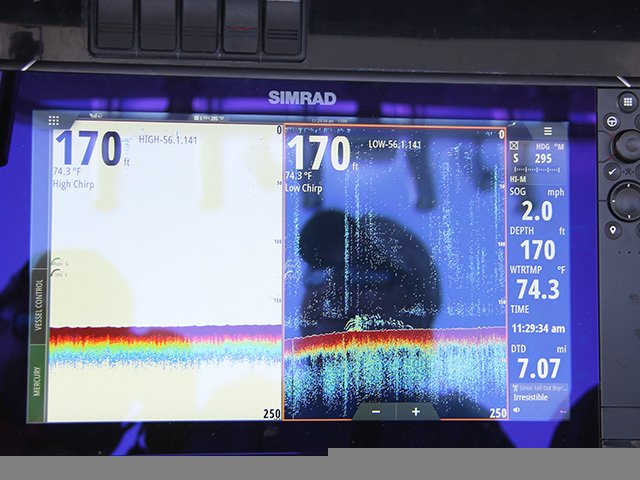 With so many units on the market today, how do you pick the best fish finder for your boat? Choosing the ideal fish finder used to be a straightforward process. We all had our own favorite brands, and most in the same pricing categories performed about the same. They looked straight down and used a 50/200 kHz beam (or thereabouts) to deliver a picture on an LCD screen which was also more or less the same from brand to brand. That, dear friends, is ancient history. This used to be a significant differentiating factor between manufacturers, and as a result, engendered serious brand loyalty. The advent of smart phones, however, has changed all that. Truth be told all the major manufacturers have now patterned their user-interfaces after the iPhone, with swipe and press menu icons that are easy to operate without reading a manual. No matter what brand you buy, it’s bound to be easy to figure out – if you can choose and open an app on your mobile device, you can operate a modern fish finder. Back in the day, most machines pinged through the depths at about 50 kHz for maximum depth penetration, or 200 kHz for better detail down to depths of a few hundred feet. These kHz ranges were good for picking out fish but offered relatively low detail levels. Today’s imagers and scanners (the exact terminology varies between brands but describes the same functionality) send out their waves at much higher frequencies, usually around 400 kHz and/or 800 kHz. The detail they provide of structure in relatively shallow water is nothing short of mind-blowing. You can see every twig on a submerged tree, and every blade of grass in a weedbed. The detail they provide of fish, on the other hand, is a bit sketchy. Different species show up better or worse at different frequencies, and these units generally don’t provide those familiar arches we know to be large fish. More often you’ll see individual dots and scattered returns which are much harder to ID as positive returns versus clutter. That level of detail for structure is great for identifying potential new hotspots when you’re fishing a shallow-water wreck or reef, but these units have very limited ranges. Some claim 150 feet and others claim more like 600, but truth be told, their advantages start to fade after 100 feet of depth (water conditions have a big impact on exact range) and they usually deteriorate rapidly when going even deeper. So while anglers may want to have a scanner/imager function on their boats for those days spent close to home, having the lower-frequency abilities of a more traditional 50/200 kHz fish finder is absolutely critical for both range and better fish identification when heading offshore. In the past few years, units offering side-scanning capabilities have become all the rage. These can be quite helpful, especially for locating structure. However, since they send out their signals at the same uber-high frequencies as scanners and imagers, they’re more useful for finding structure than they are for finding individual fish. Again, when fishing inshore this can be advantageous. But once you go offshore beyond 100 feet or so of depth, in many cases side-scanning is more or less useless. One glaring exception: when you’re fishing in areas where there are large concentrations of tightly-packed baitfish relatively near the surface, these side-winders can help you pin-point their location. 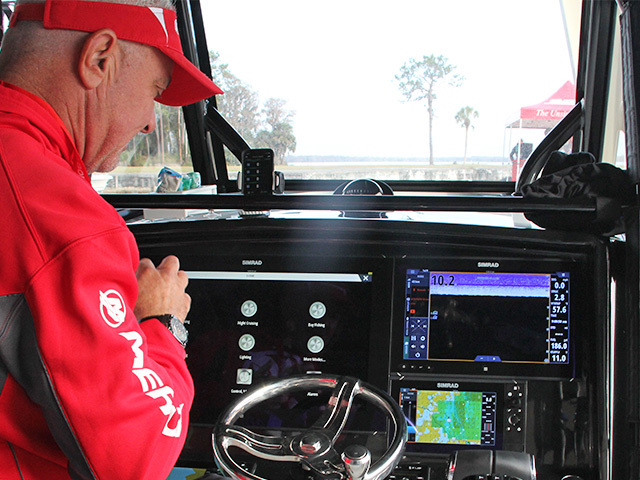 Many of today’s fish finders act like information hubs for your boat. These MFDs (multi-function displays) can display info from a number of systems on the boat, allowing you to view engine data at the dash or pick out tunes while peering through the depths. They can also act as digital switching platforms, allowing you to turn on pumps and lights right from the screen on the helm. In most cases, however, a boat has to be designed around such a system to take full advantage of it. But there’s an exception: WiFi and Bluetooth equipped units offer the unique ability to interface with your boat via your phone or tablet. This lets you use your phone or tablet as an MFD repeater, interface with various apps, and extend your link with the wider world. FishTrack’s SST service is a great example. Many people download the latest data the night before a trip and use those water temps and chlorophyll charts while offshore, comparing with the temperature and info found through their MFD. Also consider how a WiFi link between your MFD and your phone can help you utilize apps like Navionics, to data-crunch the pings and positions from your own readings and then update your digital charts with astonishing accuracy. WiFi also allows your unit to update itself without having to download the data at home and then take a card to your boat. A few years back when CHIRP was all the rage, it cost thousands of dollars. Today, even low-end models claim some level of CHIRP ability, though often it’s a mere shadow of the real thing. Unfortunately, as a result the term has become greatly abused. To figure out if a unit will enjoy the full advantage of CHIRP (sending out a multi-ping burst of energy through a range of frequencies in rapid succession) you’ll need to dig deeper into the unit’s specifications. As a general rule of thumb, the broader the range it sweeps through, the better. And units with multiple channels that can sweep more than one range at the same time have a significant advantage over single-channel CHIRP units. 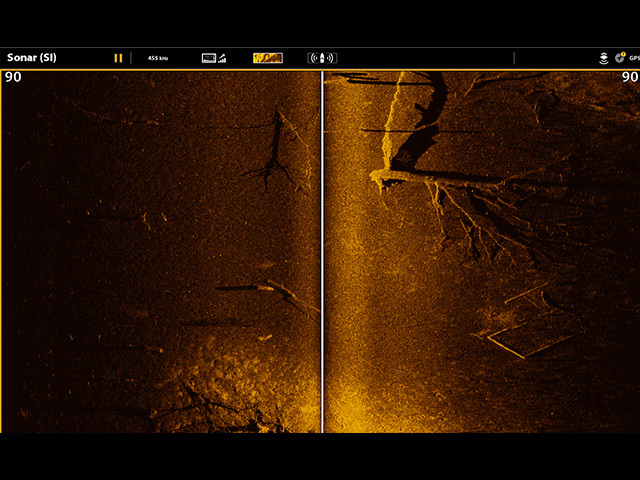 Yeah, that’s still a bit confusing, but consider this example: a Garmin GDS 25 black-box fishfinder ($2,000 for the box alone) versus their $120 Striker, paired with Garmin’s GT8HW-TM transducer ($150). The top-of-the-line GDS 25 can sweep through a range of 25 kHz through 210 kHz, for a range spanning 185 kHz. The inexpensive Striker, meanwhile, claims the ability to CHIRP through 145 kHz to 230 kHz, for a range of 85 kHz. Obviously there are many other differences between these units, but the frequency range difference should get the point across. We’ve really only scratched the surface here when it comes to determining the best fish finder for your boat or style of fishing. That said, hopefully at this point you have a solid foundation of what to look for, as you begin your search for the ideal fish finder for you and your boat.